Witness to Roswell is a "can't put down" account of what really transpired in Roswell, New Mexico, 62 years ago. This revised and expanded edition includes: A Litany of deathbed confessions describing the "Little people" recovered at the crash site. The identity of the Boeing engineer called in to examine the wreckage from the crash. The events at the base hospital and the nurse who ordered the children's caskets. The story of the soldier who wore gloves at the dinner table after guarding the bodies. Clearly, the implications are foreboding: One only need realize that officials now have four explanations for this historic event-but there is only one that all witnesses have testified to on their deathbeds. Witness to Roswell once again demonstrates to the world that no statute of limitation applies to the truth: We are not alone. Book jacket. 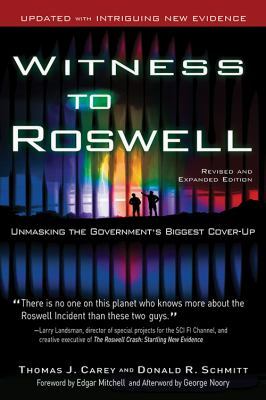 Both authors were consultants for the SCI FI Channel's documentary The Roswell Crash: Startling New Evidence. Book jacket.